Once every year the Mushroom Kingdom gathers for the Sticker Fest, a delightful celebration of stickers. On such a special night, the Sticker Comet floats down from the sky and lands in front of the gathered crowd. It is believed that if everyone concentrates and makes wishes on the comet, these will all come true. Yet this year’s event has an unexpected arrival. Bowser crashes the party with his troops in an attempt to steal the Sticker Comet, and, whilst Toads rush to intervene, ends up stumbling straight into it. This has disastrous consequences, causing the comet to shatter into individual Royal Stickers that shower themselves across the Mushroom Kingdom. One such sticker, a crown, lands on Bowser’s head granting him incredible power, and he summons a tornado that scares away the Toads in attendance. Angered by such behaviour Paper Mario rushes to stop him, but awakes the next day to find himself crumpled up in a heap and the festival left in complete disarray. And so begins this, the fourth Paper Mario instalment from the talented Intelligent Systems, shortly due to hit retail shelves as the key first-party title for Nintendo 3DS that has been lined up for Christmas. As can be expected from the developer’s pedigree, Paper Mario: Sticker Star proves a carefully woven adventure. You’re awoken by Kersti who is your guide throughout the game, having herself travelled from the faraway Sticker Star to help ensure everyone’s wishes were granted at the Sticker Fest. Naturally, she’s annoyed that the Sticker Comet has been fragmented, and vents her frustrations at a rather surprised Paper Mario. Once he’s explained his side of the story, things are then on track and you set out on your quest to recover them. It is the Royal Stickers that have the power to grant wishes, and, as their caretaker, it falls to Kersti to make sure that they are gathered so that she can return to the Sticker Star. The stickers themselves amount to the game’s greatest accomplishment, peeled from absolutely anywhere and then placed within your ever-expanding Sticker Album. Management of those you collect is paramount, and the multiple ways in which they can be implemented is joyous. A key element of the game is the ability to ‘Paperise,’ enabling you to temporarily freeze time and turn the world into a flat piece of paper. This is used for solving puzzles, granting the opportunity to interact with the environment by placing stickers, an early example being to replace a bridge that has been removed by the mischievous Bowser Jr. Having chosen the relevant sticker, you must then align its shadow to place it correctly and then smoothen out the edges. Real world objects may also be required to solve such puzzles, and these are referred to in the game as ‘Things.’ Examples include Scissors, a Fan, a Baseball Bat, a Light Bulb and a Trumpet. However, these can’t be used immediately, and must first be hurled at a special wall in Decalburg, the bustling town in which the Toads live. Doing so turns them into stickers, which may then be used as you see fit to aid you in finding the solution to puzzles or for inventive results during battle. The Hammer is provided relatively straight away, allowing you to interact with items in your surroundings by simply giving them a mighty whack! Bashing enemies, either by sneaking up on them or giving a well-timed swing as they chase after you, will give you an advantage at the start of combat by damaging your opponents. 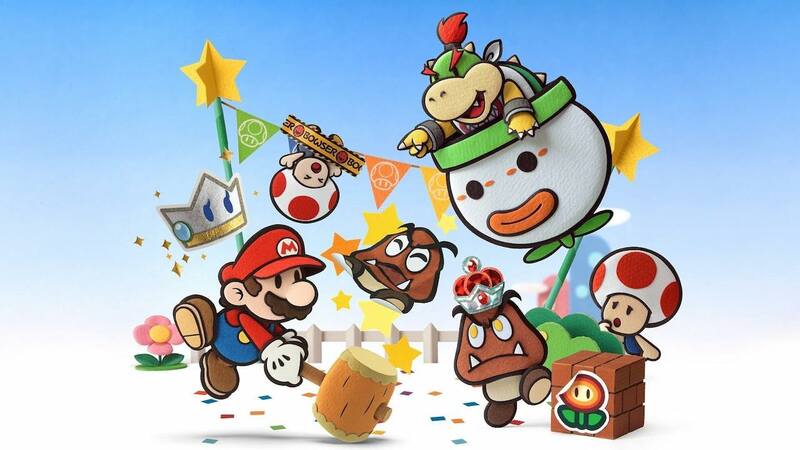 The turn-based battles themselves though feel relatively pointless, and it is here where the gameplay formula devised for Paper Mario: Sticker Star becomes unstuck. Having been stripped of RPG elements, there’s no longer any levelling up and you purely rely on the quality of the stickers that you’ve collected to determine your success. These range from ‘Worn-Out’ to ‘Shiny,’ with the rarity increasing the amount of damage that you are capable of dealing to enemies. Each sticker allows you to attack using different means, with enemies being only vulnerable to certain move types. Players may also spend coins to activate a slot machine, the amount of icons matched providing them with extra attack choices for their next turn. Once you’ve run out of stickers, which can happen during fights, your only option is to then trawl through previously visited courses to restock your Sticker Album. If you aren’t careful, this will happen on a frequent basis and such repetition will soon begin to grate. Bosses which await you at the conclusion of each of the game’s Worlds often sap up your plentiful supply, although are often able to be tackled far more quickly by exposing weaknesses using specific ‘Things.’ Yet this is never really pointed out to the player directly until you’ve been defeated countless times and your enthusiasm begins to dwindle. To make matters worse, the help you are provided with are cryptic clues from Kersti that often aren’t obvious enough. There is essentially a lack of clear signposting throughout the game when you’re confused, an affliction that the series has suffered from before. Most players will find themselves turning to walkthrough guides to ease their rising frustration, a point that shouldn’t need to be reached. Paper Mario: Sticker Star still has much to applaud, however. An energetic soundtrack matches its distinctly stylised world, with stereoscopic 3D granting intricately layered visuals that showcase the very best of what can be achieved on the handheld. There’s plenty of humour and commendable localisation work on the script too, a recognised hallmark of the series. It is just shame that Paper Mario: Sticker Star isn’t capable of matching the, admittedly challenging, standard previously achieved within the series.